I found a new cooking magazine at the store the other day. It's called "Fine Cooking." I was perusing the latest issue earlier today when a recipe caught my eye. I say it was a recipe, really it was a technique. It consisted of roasting a pan of whatever veggies you have on hand, then wrapping them in a cream cheese based pastry and baking until golden brown. I knew right then, I had a winner of a dinner. I don't remember what veggies the magazine used. I used summer squash, red peppers, potatoes, onions and swiss chard. I chucked in some rosemary, thyme and lemon set, and roasted them in a foil covered brownie pan at 375 degrees for about 40 minutes. 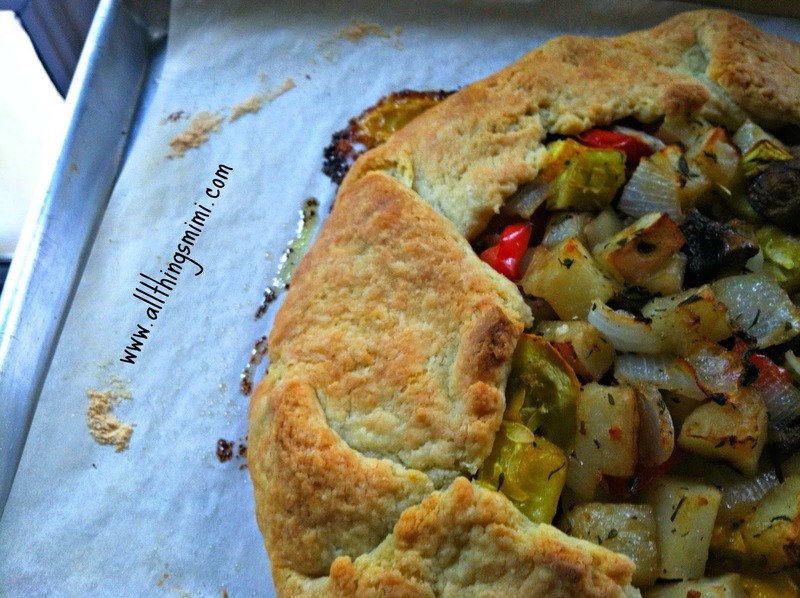 I put the veggies aside to cool while I made the crust. The pastry crust was pretty simple. I put 1 1/2 cups of plain flour, 6 oz of unsalted butter (cut into little pieces), 6 oz of cream cheese (also cut into little pieces) and about a teaspoon of salt in my food processor. I pulsed it about 20 times, then added maybe 3 tablespoons of water to get the dough to hold together. I rolled it out in a huge circle- ok. It really wasn't a circle. I don't have that much talent. It was more like an amoeba. I had a 5 oz container of goat cheese that had been softening on the counter for about an hour. After I rolled the dough out, I used the back of a soup spoon to spread the goat cheese on the crust, leaving about a 2 inch border around the outside. 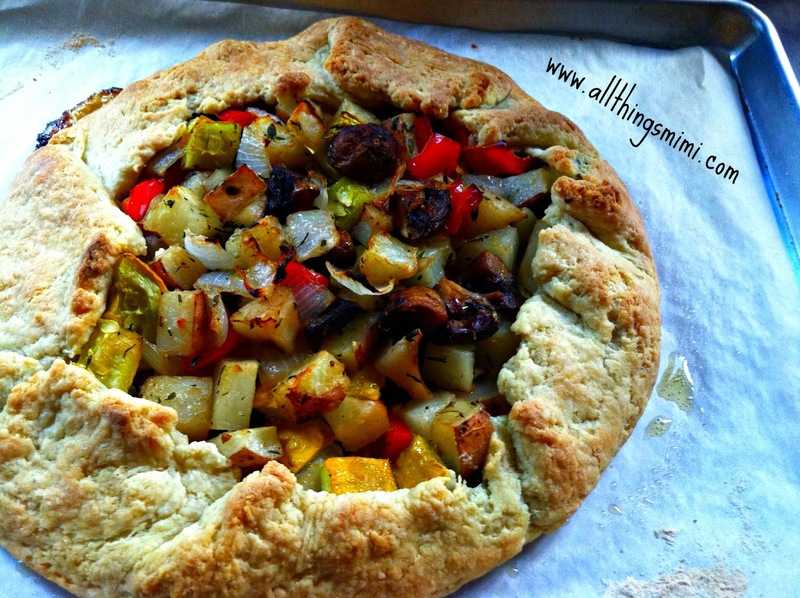 Then I piled all the roasted veggies in the center, and brought the edges of the crust up over them, pleating as I went along. Into a 400 degree oven it went for about 45 minutes. I let it sit for 10 more while I threw together a simple salad of cucumbers and tomatoes. Next time, I won't use as many veggies. I think it was too heavy for the crust. I think roasted potatoes and onions with a little gruyere would be fabulous! The crust was incredible, though. It tasted so rich from the butter and cream cheese. And really, as far as pie crusts go, this was almost too easy! I will most definitely do this again, with the aforementioned changes. It would also be amazing with fruit!